Today must be wireless kit announcement day over at SVS. First we got the speakers, and now we have the SoundBase. This $500 stereo amplifier is intended to smarten up a set of existing speakers with the DTS Play-Fi platform (i.e. many streaming services + local DLNA server support). So you can ditch the HTPC + amp (or similar) for all your critical listening. Important stats include 150 watts per channel and 192KHz/24-bit DAC processing, and an expected ship date ~ October 22 as well. SVS Launches Prime Wireless SoundBase, Dual-Threat Wireless Audio Component. SVS Prime Wireless SoundBase brings immersive sound, high-resolution wireless audio streaming, powerful amplification, and future-facing connectivity and control to conventional speakers. Or, with its line level output, it converts any two-channel stereo system or AV receiver into a smart wireless audio zone fit for the most discerning audiophiles. Youngstown, Ohio – October 3, 2018 – SVS, manufacturer of high-performance speakers, subwoofers and audio accessories, proudly announces the SVS Prime Wireless SoundBase as part of the new SVS Prime Wireless family of products from the American audio brand. Prime Wireless SoundBase transforms speakers with high-res wireless audio streaming, future-facing connectivity and smart speaker control, while driving them to their full potential with effortless power from a 300 watt amplifier and high-end DAC. Conventional speakers connect directly to the Prime Wireless SoundBase via standard five-way binding posts and receive a massive 150 watts per channel; more than enough power to drive any full-range tower, bookshelf or other speakers to sound their best. A 192KHz/24-bit DAC ensures a pristine high-resolution signal path and sound quality that is always pure, natural, transparent and faithful to the source material, no matter what’s streaming or connected. In its other role, the Prime Wireless SoundBase unlocks high-res wireless audio streaming, multi-room music playback and more in existing AV systems by connecting directly to an AV receiver or two-channel stereo system via line level output. It can be used to create a separate stereo zone or transform home theater systems by adding advanced connectivity, intuitive WiFi app or voice control, and wireless access to all streaming content. Most importantly, it delivers reference quality sound without compromises. A dual-band WiFi connection provides uninterrupted playback and direct access to the most popular wireless streaming services via the DTS Play-Fi app, including: Spotify, SiriusXM, Pandora, Amazon Music, Tidal, NPR, Internet Radio and many more. Bluetooth with aptX and AAC also allows high-resolution wireless audio streaming from any smartphone, tablet or mobile device. Control of the SVS Prime Wireless SoundBase is simple and smart. Users can access music and adjust playback settings from their favorite seat or while moving around the house using the WiFi connected app. Voice control of music is possible through Amazon Alexa devices so there’s always a “hands-free” option for controlling volume, multi-room playback, streaming sources and more. Unique to the SVS Prime Wireless family are six front panel presets that provide instant access to a user’s favorite Spotify or Pandora playlists, Internet Radio stations and other streaming music services without needing a phone or tablet, since they stream directly from a home’s WiFi network. Users simply program the presets and then push the left front dial to toggle between their favorite audio content with a single tap. With the DTS Play-Fi app, Prime Wireless SoundBase users can access streaming services, radio guides, multiple playback devices or a home media server from any mobile device and distribute it throughout their home to as many as 32 different products in 16 zones. Multiple Prime Wireless SoundBase units can also be connected together as the foundation of a whole-home wireless audio system. Connectivity options abound in the SVS Prime Wireless Speaker System, giving it endless versatility. Optical and line level inputs can be connected to TVs, gaming consoles, CD players, AV Receivers, computers, mobile devices and more to provide a bolder and more immersive sounding option than soundbars and a more affordable alternative to AV receiver/speaker set-ups. Plus, unlike closed-network wireless audio systems, Prime Wireless SoundBase integrates with hundreds of other DTS Play-Fi wireless audio products from all different brands. For deeper bass and a more thrilling audio experience, a subwoofer output provides easy connection to a subwoofer from SVS or any other brand. A USB port allows convenient charging of mobile devices or the addition of an SVS SoundPath Wireless Audio Adapter to make subwoofer connectivity fully wireless. MSRP of SVS Prime Wireless SoundBase is $499.99, pre-orders available now at www.svsound.com. Estimated shipping week of October 22. SVS Prime Wireless Family: Smart. Immersive. Magic. 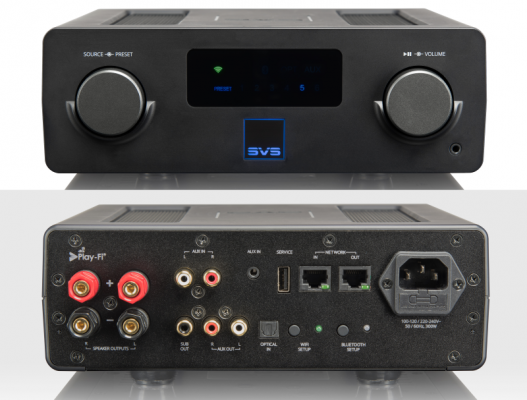 The SVS Prime Wireless family of products also includes the new Prime Wireless Speaker System, an active-passive two-channel speaker array sporting advanced connectivity via WiFi, Bluetooth, line level and more, marries up with a 200 watt (50 watts x 4) amplifier, powerful 192KHz/24-bit DAC and precisely tuned digital crossover to bring audiophile sound quality to the wireless smart speaker category for the first time. The Prime Wireless Speaker System has an MSRP of $599.99. For more information, please visit www.svsound.com or follow them on Facebook, Instagram, YouTube, Pinterest or Twitter.